Plans to give new parents a free goody box of essential items will be considered if Mark Drakeford becomes Wales' next first minister. Baby bundles, similar to those launched across Scotland in 2017, would contain things such as clothes and blankets, presented in a Moses basket. Mr Drakeford, who hopes to succeed Carwyn Jones as Labour's next leader in Wales, would welcome a bundle pilot. He said it was a "great proposal" that would help tackle child poverty. The finance secretary is one of the main contenders to be Welsh Labour leader when Mr Jones stands down in December. The Cardiff West AM's leadership election pledge comes after main rival Vaughan Gething was backed by former UK Labour leadership contender Owen Smith. 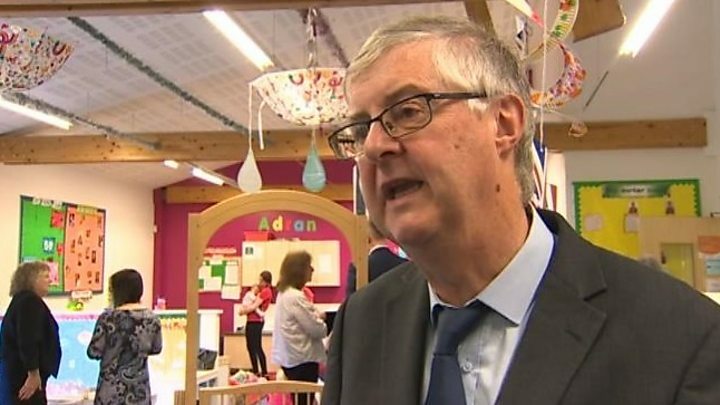 Mr Drakeford, who was health minister between 2013 and 2016, said it would fit with Welsh Labour's drive to tackle poverty and infant health issues. BBC iWonder - How are new babies celebrated around the world? "We would start it with a pilot scheme in a defined geographical area which would be evaluated to find out what works best for parents and to assess its impact." Baby boxes originated in Finland, where the scheme has been in operation since the 1930s. The Welsh Government said it had "no plans at present" to launch the baby bundles but Mr Drakeford would want the government to fund them - costing between £100 and £150 each - if he becomes first minister. With about 32,000 births a year in Wales, the annual price tag for a nationwide scheme could range from £3m to £5m. He suggested the bundles would be based on a Moses basket - rather than a box as in Scotland - and would include clothes, a digital ear thermometer, baby sling, books and a play mat. "It is clearly aligned with our agenda of tackling poverty and infant health issues," he added. "This scheme would also give us a way of giving parents-to-be important practical information and guidance on things like safe sleeping positions and breastfeeding. "It could go to every parent, regardless of income, because we all need a little help at such a momentous time in our lives." The Welsh Conservatives called the proposal an "SNP baby-box rip-off"
Welsh Conservative and Shadow Health Secretary Angela Burns said: "This baby box PR stunt is unwise as it does not allocate money to where it needs to be: like free prescriptions, the richest in society would be just as eligible as the poorest to take advantage of taxpayer-funded freebies." Do baby boxes really save lives? The scheme in Scotland prompted some controversy over the use of the boxes themselves as places in which babies can sleep, following claims that they had contributed to a reduction in cot deaths in Finland. Cot death charity The Lullaby Trust said it was unhappy some boxes were being marketed on that basis, although Scottish ministers said the boxes met the highest UK safety standards for sleeping in. However, academics in Finland have spoken of a misunderstanding over the impact of baby boxes there, pointing out they were introduced at the same time as state-funded pre-natal care. Mr Drakeford and Mr Gething are the only contenders with enough backing from Labour AMs to make it onto the Welsh leadership ballot paper - but Eluned Morgan, Huw Irranca-Davies and Alun Davies have also said they want to stand in the election.